Learn from anywhere, anytime and on any device! What does WHMIS stand for? WHMIS stands for Workplace Hazardous Material Information System. All employers whose workplaces handle hazardous materials or products are required to show due diligence in ensuring their employees are WHMIS trained. WHMIS systems must be reviewed every year, including some measure of training. WHMIS is Canada-wide legislation, dealing with controlled products in the workplace. A new WHMIS system, WHMIS 2015 was introduced in February 2015. This new system is expected to replace the old system by December 1, 2018.
Who might benefit from this online WHMIS 2015 training course? An employee intending to work in an environment where hazardous materials are handled. How long does it take to complete the online WHMIS 2015 training course? The course is designed to take ½-day (about 4 hours). However, to make it flexible and convenient to fit into your busy schedule, we don't limit the time you take to complete the course. You can complete the course in a day or a week if you wish. 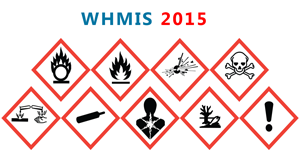 How is the online WHMIS 2015 training course taught? 1: Pay for the course by clicking the BUY BUTTON below. A notification will be sent to us confirming your payment. 2: After paying you'll be redirect to a page with clear instructions on how to create an account. If you are not redirected to the page with instructions, contact us by phone or email. 3: Once you create an account, we shall give you access to the course. The courses are available 24/7 from anywhere with access to internet connection. Enjoy!